Last Week in Review: Existing Home Sales slipped, but New Home Sales soared. Forecast for the Week: Personal Consumption Expenditures and GDP could stand out in the packed calendar of data releases. View: Master the art of storytelling to boost business. “Slip slidin’ away.” Simon and Garfunkel. Existing Home Sales slipped in February, but all the good news didn’t slide away. On the positive side, sales of new single-family houses in February hit a seven-month high and were up 6.1 percent from January to a seasonally-adjusted annual rate of 592,000, according to the Commerce Department. New Home Sales in January also were revised up to a rate of 558,000. February’s sales are 12.8 percent above the February 2016 estimate and a welcome sign to prospective homebuyers who have struggled with limited inventory and rising home prices throughout the country. 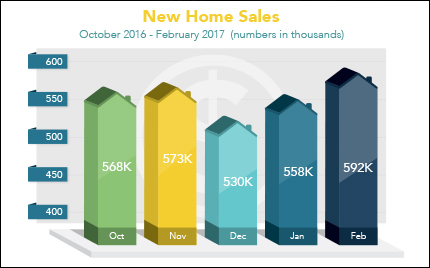 After starting 2017 at the fastest pace in almost a decade, Existing Home Sales slid in February, according to the National Association of REALTORS®. Despite the slide, sales remain above February 2016 levels nationally and in all major regions. Existing Home Sales fell 3.7 percent from January to a seasonally-adjusted annual rate of 5.48 million in February, but are still 5.4 percent above a year ago. Total existing housing inventory for sale at the end of February increased from January. However, inventory is 6.4 percent lower than a year ago and has fallen year over year for 21 straight months. Homebuyers and those looking to refinance also had good news this week as Mortgage Bonds, and the home loan rates tied to them, benefited from the uncertainty that emanated out of Washington D.C. In the lead-up to the healthcare reform vote originally scheduled in the House for Thursday, investors weren’t comfortable with the uncertainty surrounding the bill, giving Mortgage Bonds a boost midweek. Currently, home loan rates remain near historic lows. The inflation-reading Personal Consumption Expenditures and GDP could stand out in a crowded week of consumer and economic data. Wednesday brings the release of Pending Home Sales. The third reading of fourth quarter 2016 Gross Domestic Product will be unveiled Thursday. Regional manufacturing data via the Chicago PMI will be released on Friday, along with Personal Income, Personal Spending and Personal Consumption Expenditures. As you can see in the chart below, Mortgage Bonds benefited from the uncertainty in Washington D.C. leading up to Thursday’s scheduled healthcare reform vote in the House. Investors are not comfortable with uncertainty. The vote ultimately was rescheduled. Stories are the original “viral” marketing tool. Where facts and figures don’t always stick, a great story can’t wait to be retold. Whether you’re delivering a leadership message to your team, a sales message to a client, or presenting to a local organization, telling a story can make you more memorable and help spread the word about your expertise and leadership. Consider your takeaway. What is the core truth you want to convey or the key action you want listeners to take? Getting to this bottom line will help you choose the best way to illustrate your message in a story that conveys that truth or inspires that action. Overcome an obstacle. Without a challenge to overcome, there’s no story. Make sure to depict how you, your product or your service helped overcome an obstacle. Ideally, this should relate to the common challenge your audience also wants to overcome for themselves, so they can see the obstacle — and the ability to overcome it — clearly. Use your own experiences to paint the picture. Think of where your failures or successes might be an emotional entry point into a story, and how they relate to the results you’ve achieved. Your direct, personal understanding brings an element of authenticity that’s engaging. Keep it simple. The most effective business stories are clear-cut. Unless relevant to the story, leave out details like the day of the week, what you had for breakfast or the color of your socks. Stick with details that directly add to the point of the story. Want to start telling better stories? Read more details and case studies that can help you craft your most effective business story.